10 pack of trade quality 4” mini refills with short pile fabric, suitable for satin and gloss paints The small ¼” synthetic nap roller covers apply paint with an even pickup. They are ideal for a smooth and semi-smooth surfaces such as plasterboard. They are ideal for use on walls and wooden surfaces. Premium synthetic ¼” nap provides an even finish on semi smooth surfaces. These covers are ideal with high gloss and satin finishes and will distribute paint evenly on the surface. Provided in a 10 pack offering to give the best value and have consistency throughout the job. The Rodo Mini Roller Frame is the ideal frame for use with the Rodo Mini Roller Tray. Rodo Mini Roller Frames are great for hard to reach areas and small spaces. Fits all 4-1/2” Rodo Mini Roller Covers. The Rodo Plastic Mini Roller Tray is for use with the Rodo Mini Roller frames and Refills. Features a high efficiency grid pattern. Also features ergonomic hand grips, oriented at the paint well end of the tray, that eliminates stress on the hands and arms. 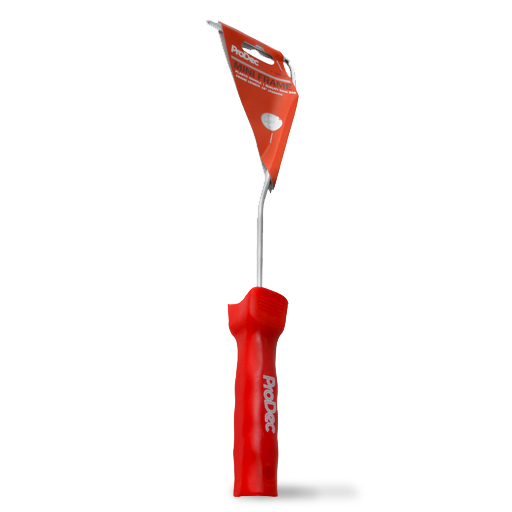 Extend your reach with the innovative, professional 2ft small Rodo Prodec Extension Pole. It featuries a custom adjustment and an innovative combination quick connect / threaded attachment. Very lightweight and durable extension pole with integral hand rest. It's a very lightweight and durable extension pole. Designed to help alleviate stress and strains when painting. Ideal for click-lock and screw-fit frames.